Homologous structures are organs or skeletal elements of animals and organisms that, by virtue of their similarity, suggest their connection to a common ancestor. These structures do not have to look exactly the same, or have the same function. The most important part, as hinted by their name, is that they are structurally similar. Monkeys, cats, rats and other mammals have tails. In mammals, the tail is an extension of the torso, made of flexible vertebrae. Tails primarily function to ward off insects, but they can also serve as sources of balance for more aloof species, like cats. Humans possess a similar feature known as the coxxyx, or tailbone. Also an extension of the torso, it is made of what some scientists call “rudimentary vertebrae” and is thought to have once been a fully-formed tail. Unlike other mammal tails, however, it currently serves no purpose. The fact that the structure of the human coccyx so closely resembles that of an animal tail gives scientists reason to link it to a common ancestor between mammals and humans. Due to this link, the mammalian tail and the human coccyx are homologous structures. Not all animals can see the way humans do. 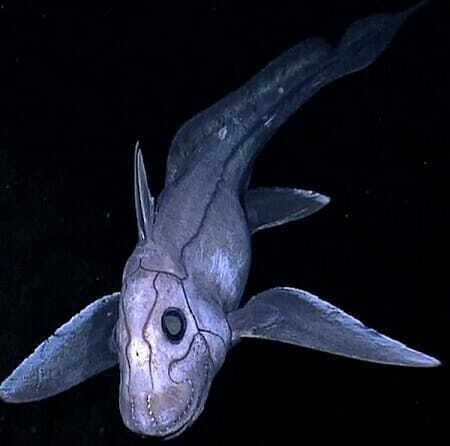 Deep sea creatures, like the chimera, live in an environment so dark, their eyes have not developed the sophisticated discriminatory skills that have, human eyes. Their visual cues come from light receptors near the front of their skull, and they do not see color or depth. Like light receptors, the human eye catches light and sends that information to the brain. As we humans have evolved in an environment fully illuminated by the sun, their eyes contain extra filters, or photoreceptors, that allow us to perceive colors, shadow, and distance. More specifically, rod-shaped photoreceptors allow us to see black-and-white and shadow, and cone-shaped photoreceptors allow us to see color and saturation. The image shows a blind chimera that “sees” with light receptors. The image shows a human eye uses rods and cones to convert light into images. Thanks to evolution and environment, the function of the human eye developed into something far more sophisticated than that of deep-sea creatures, like the chimera. However, despite our ability to see full images and the chimera being restricted to only shadow, the fact that both eyes and light receptors “see” by taking in light confirms there possible connection to a common ancestor and, therefore, structurally homologous. Giraffes are the subject of wonder and amazement, and rightly so. Since Carl Linnaeus first classified them in 1758, these animals have captured the eye of all who explore the Sahara. Their long necks, especially, gather the bulk of attention. Although they measure up to eight feet in length and weigh over 600 pounds, they contain only seven cervical vertebrae, or neck bones. Looking at the image below, we see that these bones tend to be longer – about one foot in length. Humans also have cervical vertebrae, but they tend to be far shorter than those of the giraffe. Examining the human neck diagram, human cervical vertebrae appear much shorter and squatter than those of the giraffe. 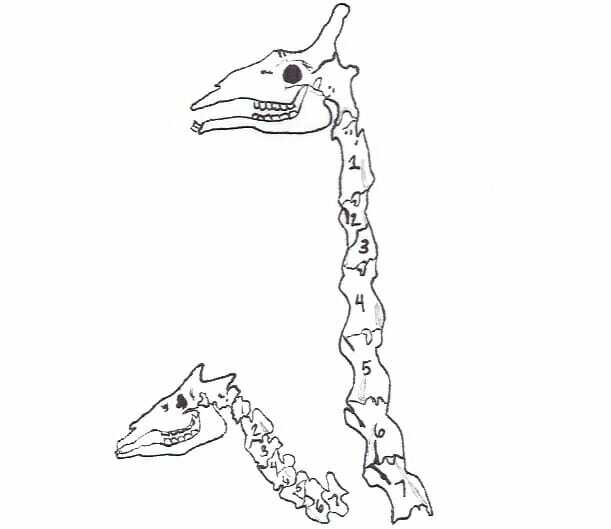 Nonetheless, both human and giraffe necks contain seven bones. This number, when combined with the similar structure of the human and giraffe spine, allows the scientific community to posit that humans and giraffes, as different as they may be, share a common ancestor. As such, their cervical vertebrae are structurally homologous. Coccyx – The “tail bone” at the end of a mammal’s spinal column. The coccyx may be composed of fused vertebrae, or it may extend into a tail. Photoreceptor – A structure, usually a cell or small organ, which detects any light that falls on it. Cervical vertebrae – The bones that provide support for the upper spine. A. Link both species to a common ancestor. B. Look exactly the same. C. Move in the same direction. D. Follow similar growth patterns. A is correct. Homologous structures must be similar enough that they suggest that two species share a common ancestor. However, they do not have to serve the same function. 2. Only mammals can share homologous structures. False. While mammals share a number of homologous structures, homologous structures are not shared exclusively between mammals. Human eyes, for instance, are homologous to photoreceptors found in deep-sea creatures. A. They are better-suited for dark environments. B. They get better reception. D. They contain rods and cones that interpret the image created by light information. D is correct. Human eyes contain rods and cones, which allow them to see color and depth more clearly. Since chimeras live in a dark environment, their eyes have only evolved to the degree that they can detect shadow.